Two kinds of cats' eyes. Both are non-negotiably creepy. Photos in the public domain. Nature's inventiveness often inspires human innovation as in the well-known case of hook-and-loop fasteners: Swiss engineer George de Mestrel turned a hiking annoyance (burrs) into a handy tool (Velcro). 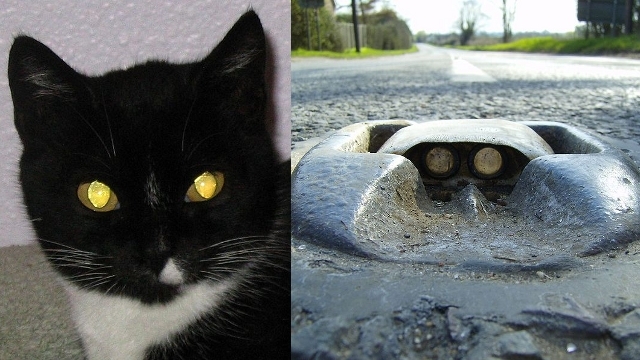 But did you know that safety road markers were inspired by a cat's eyes reflecting headlights? For some reason, I find that much creepier than the Velcro story -- especially the early advertisement depicting a row of live cats sitting helpfully along the median. "Eyeshine" may be most familiar as a feline phenomenon, but it occurs in a tremendous variety of animals, from moths to whales. It's caused by the tapetum lucidum, a reflective layer behind the photosensitive part of the eye which bounces photons back, giving them a second chance to be seen. This ability is a major advantage at night and in the deep sea and has evolved many times in many different forms. Crocodiles and opossums use small particles to achieve diffuse reflection; deep-sea fish have layered crystals that reflect like a true mirror. Horses and whales reflect with an organized mesh of fibers; cats, dogs, seals and sharks all use crystal-containing cells. Sharks are uniquely able to cover theirs up if the environment has too much light (Sharks: 1, Cats: 0). Eyeshine is just one of many rabbit holes of curiosity opened by a visit to "Hidden Heroes: The Genius of Everyday Things," an exhibit currently on display at the San Jose Museum of Art which features both Velcro and safety reflectors. 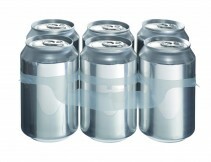 "Hidden Heroes" was conceived by Hi-Cone, a division of the multinational company ITW that produces those ubiquitous plastic rings for carrying six-packs. Their slogan is the not un-creepy, "We are all around." Concerned by the public's failure "to consciously perceive the invention and its ingenuity," Hi-Cone convinced Germany's Vitra Design Museum to create an entire exhibition of commonplace objects (including six-pack rings, of course). The online exhibit contains 44 heroes, 35 of which are touring internationally in meatspace. San Jose is only one of two host locations in the US; the other was the MIT museum. It's fun to see an installation in the middle of Silicon Valley rhapsodizing about low-tech advances like adhesive tape and paper clips. Even the nature-inspired inventions seem far removed from modern biomimicry, with its custom nanomaterials and drug-delivering viruses. 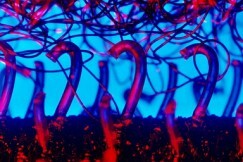 Micrograph of hook and loop fastener by Natural Philo. This contrast illustrates the fun fact that our ability to be inspired by the natural world doesn't depend on actually understanding the natural world. De Mestrel studied burrs under the microscope in order to replicate their loops in fabric, but as far as I know, inventor Percy Shaw never so much as dissected an eyeball. Yet his "Catseye" road reflectors are used around the world. And what about bubble wrap, that beautiful blend of packing buffer and emotional balm? Supposedly, engineer Marc Chavannes was inspired by noticing that clouds seemed to "cushion" his descending airplane. I'll leave that rabbit hole as an exercise for the reader.